Anne of Green Gables coined the phrase. Scope for the imagination. That about sums up these vintage patterns - aren't they a hoot? I can't see anyone wearing them today unless a hefty dose of imagination was applied. The caftans on the right remind me of Mrs. Roper from Three's Company, and the ones on the left - all I can think is they'd hide a multitude of sins. If you've got some sins you want to hide, enter to win both patterns by leaving a comment below. Giveaway open to anyone, anywhere. I will choose a winner this Saturday night after my camping trip (provided I'm not eaten by a Grizzly). And check back Monday for another giveaway - remember Sew Mama Sew is coordinating the mother of all giveaways this Monday May 17th. See you then! I think they would be fun to play around with! I giggled when I read your reference to Mrs.Roper...I still watch re-runs of threes company...Love it! Add a belt and they might just work today=) Put my name in! SO much fun!!!! I would love to try and get creative with these. Or at least make a really great Halloween costume! I love the "proportioned to your height" on the right one! Being that I am 6 feet tall, I can only imagine what that might mean for the circumference on the hemline: "Don't worry, hon, you can pull off 14 feet no problem!" Yet, I am strangely drawn to them. 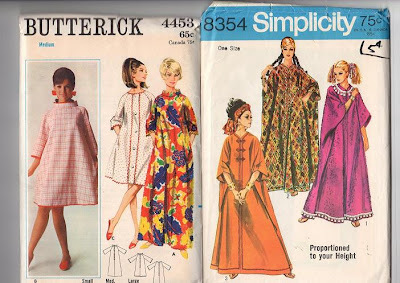 I LOVE vintage patterns...I may never use all the ones I have but they give me great inspiration! Ooh, I want these so badly! Totally my style, and I'm tall, so the ability for customisation is a plus. P.S. My mom was Mrs. Roper for Halloween last year!